Stems: Ascending, simple or branched distally, tomentose. Leaves: Cauline; blade elliptic in outline, usually pinnatifid with 3-5 lobes, sometimes entire, .2 to 2 inches long, .2 to .8 inch wide, ultimate margins entire, lobes .02 to .07 inch wide, surfaces tomentose. Inflorescences: Heads discoid, in arrays 4-12 inches. Involucres campanulate, .08 to .12 inch wide. Phyllaries 5-20 in 2-4 series lanceolate, tomentose. Flowers: Ray florets 0. Disk florets 10-50: peripheral 1-5, pistillate, sterile; central 7-25, bisexual, fertile; corolla yellow, .04 to .08, glandular-pubescent. Fruits: Achenes fusiform, less than .04 inch; seed 1; pappus absent. 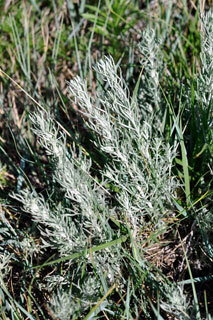 Uses: The Navajo took an infusion of leaves for coughs and fevers and used the seeds for food. Comments: Herbs, from a woody caudex, usually also rhizomatous. Artemisia for Artemis, Greek goddess of hunting, wilderness, and wild animals and carruthii, for American botanist James H. Carruth.